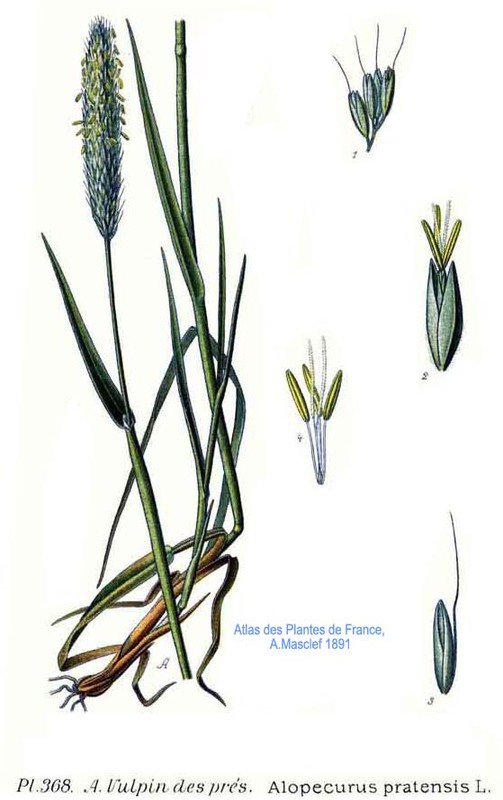 Alopecurus pratensis is a perennial, C3 grass (Waller and Lewis 1979), 40-80 cm tall, colonial from creeping rhizomes. Leaves alternate, blades flat, 0.2-0.6 cm wide, somewhat waxy-pale (glaucous) ligules membranous, sheaths loose, sometimes inflated above. Flower spikelets purplish, 0.4-0.5 cm long, 1-flowered, glumes equal, 0.4-0.6 cm, membranous, 3-veined, strongly flattened, keel hairy, winged, lemma as long as glumes, long-awned from near middle, awn 0.3-0.6 cm, longer than lemma, bent; inflorescence spike-like, but with many very short branches, 2-8 cm long, 0.5-1 cm wide, dense, cylindrical; blooms May-June. Fruit dry, hairy. Frequency in NYC: Infrequent, but apparently widespread. Habitat: Roadsides, wet meadows, soil pH 5.8-8; moderately tolerant of fire, light shade; intolerant of anaerobic soil, but can tolerate some flooding in brackish water (Duke 1983), intolerant of drought, (USDA, NRCS 2006). Notes: A pasture grass. Possibly planted in wetland seed mixes.